"Exile is a genetic mutation that stays with you,"says Cynthia Kaplan Shamash, who was forced to flee Iraq aged 9 with her family in 1973. Listen to her being interviewed by Sarah Ivry of The Tablet. The steady stream of people currently fleeing Syria for Europe is a sobering sight, but it’s not a new one. The plight of refugees all over the world is age-old. 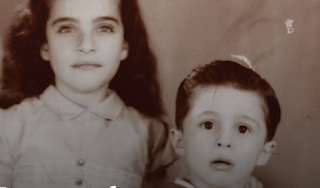 Cynthia Kaplan Shamash was a child refugee in 1972, when her family—among Iraq’s last Jews—tried to flee their homeland. Their first attempt was thwarted, and the family landed in jail. A second attempt was a success; Cynthia is now a dentist in the United States, but the family’s itinerancy came with great personal losses. In The Strangers We Became: Lessons in Exile From One of Iraq’s Last Jews, Shamash details her family’s exile from Iraq to Israel to the Netherlands. She joins Vox Tablet host Sara Ivry to discuss her mother’s bravery in the face of Iraqi police, her father’s sense of dishonor once exiled, and what she feels when she sees news of desperate refugees coming out of the Middle East now.